GLENDALE, Calif.--(BUSINESS WIRE)--Feb. 1, 2019-- Can’t make your way to New Orleans for Mardi Gras this year? Not to worry, because Applebee’s® has you covered with its newest Neighborhood Drink of the Month. 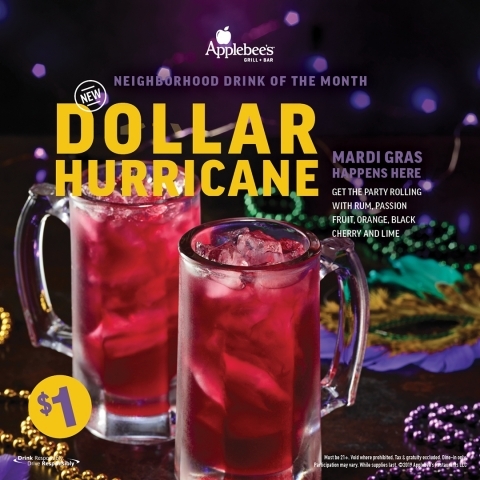 For the entire month of February through Mardi Gras on Tuesday, March 5, Applebee’s brings the party and spirit of the celebration to neighborhoods across the country with a spin on one of the most famous cocktails to come out of the French Quarter, the DOLLAR HURRICANE. Applebee's Neighborhood Grill & Bar offers a lively casual dining experience combining simple, craveable American fare, classic drinks and local drafts. All Applebee's restaurants are owned and operated by entrepreneurs dedicated to serving their local communities, and offering quality food and drinks with genuine, neighborly service. Applebee's is one of the world's largest casual dining brands; as of September 30, 2018, there were 1,875 Applebee's franchise restaurants in all 50 states, Puerto Rico, Guam and 13 other countries. Applebee's is franchised by subsidiaries of Dine Brands Global Inc. (NYSE: DIN), which is one of the world's largest full-service restaurant companies.